Limited Time Only! 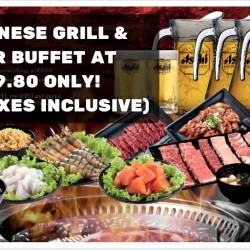 ROCKU Yakiniku: Japanese Grill Buffet with Free Flow of Asahi Beer or Soft Drinks at $39.80! Indulge in a Japanese Grill Buffet with Free Flow of Asahi Beer or Soft Drinks at ROCKU Yakiniku for just $39.80 (worth $84.80)! Grab this Groupon deal now before it's gone!